HELP! MY GUMS ARE BLEEDING! Like many people, you begin your morning routine with brushing and hopefully flossing your teeth. Halfway through your routine, you notice something is a little different. There is a very small amount of blood in the sink. You rinse and go about your day. However, the next time you brush, you notice your gums are irritated and bleeding. What is causing your gums to bleed? There are several different reasons for your gums to become irritated and begin bleeding. Here are a few of the top reasons why your gums are bleeding and what you can do about it. When plaque builds up near the gum line and is not removed when brushing and flossing, gums can become inflamed and irritated. Because of this, you may notice blood in the sink after brushing or flossing. Although gingivitis is painless, not doing something about it can lead to periodontal disease which may affect other parts of the body and overall health. You may have the best oral hygiene of anyone you know, but if you smoke, there are other factors that play a role in causing your gums to bleed. Tobacco has additional toxins that when inhaled via smoke can be difficult to remove. When these toxins build up near the gum line, they can cause inflammation and bleeding gums. Calling it quits on your tobacco use can work wonders on your oral health. Unless you have been properly taught about oral hygiene, there is a chance that your choice of oral hygiene methods are causing your gums to bleed. Are you brushing too hard? Are you brushing enough? Are you flossing? Is your oral hygiene routine consistent? Brushing too hard can cause trauma to your gums and cause them to bleed. Also, if you are not consistent with brushing and flossing, you may notice bleeding gums when you push yourself to be better with taking care of your teeth and gums. As stated earlier, there are several reasons that can cause your gums to bleed. 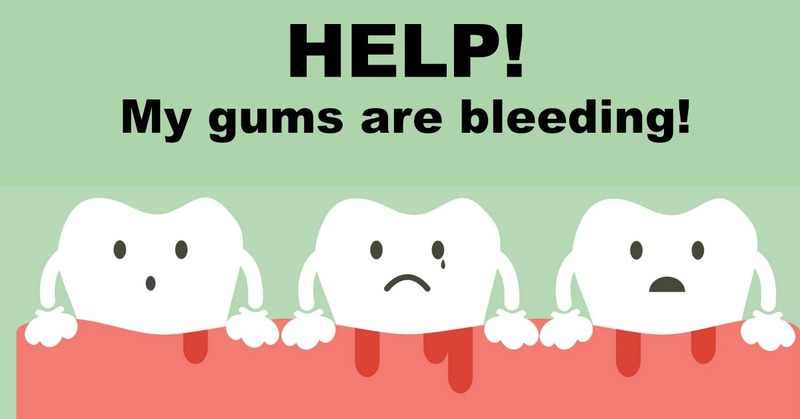 Some of the other culprits behind bleeding gums are medications, fluctuations in hormones, stress, poor diet, genetics, and an unbalanced bite. First and foremost, commit to a consistent oral hygiene schedule of brushing and flossing your teeth. You can invest in tools such as an electric toothbrush or a water pick for flossing. However, the very best thing you can do about your bleeding gums is to visit your dentist every six months or as suggested by Dr. Reese. Routine visits to get your teeth cleaned and examined will help you know what is going on inside of your mouth and how you can fix any issues that arise. You wouldn’t just ignore your head bleeding after brushing your hair, so don’t ignore your bleeding gums. You can request an appointment online by clicking here or by giving us a call at (870) 424-5900 to schedule your appointment to see Dr. Reese.